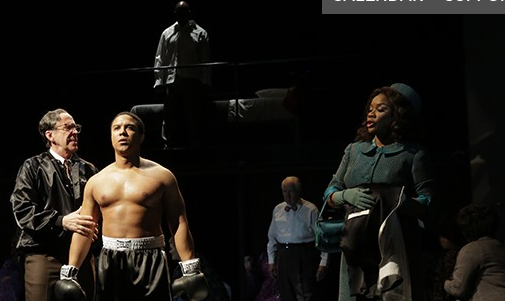 It doesn’t take long into the World Premiere of the new jazz-opera, “Champion” at Opera Theatre-St. Louis to realize that you’re watching something historic. The libretto by Michael Cristofer and the music by jazz composer and musician Terence Blanchard unfold like a wave of fresh, dramatic power over the audience. Each moment gets more exciting than the last until we hit the mesmerizing finale. It’s truly a work of art and the jazz inspired score simply rolls over you with a feeling that you’re onto something great. Of course, the tremendous cast and superlative direction by James Robinson helps the creation as does the spirited baton of George Manahan. This is a story based on real life events in the life of boxer Emile Griffith and his rise from the tragedy of accidently killing another boxer in the ring to a long reign as world champion and then his decline due to dementia caused by too many blows to the head. But another story surfaces about his closeted homosexuality (this is the 1960’s, after all) and how that affected his life in and outside the ring. Simply put, this cast is amazing. Arthur Woodley shines as the older Emile, opening the opera in confusion as he wonders where his other shoe is. His adopted son and now caretaker, Luis, played with expert precision by Brian Arreola, tries to calm him down. Woodley, in a truly remarkable performance, observes through much of the flashbacks of his younger life, looming over the proceedings like a ghostly presence trying to change moments that went wrong and remember the good times with his addled perception of a curious life. As the young Emile, Aubrey Allicock looks the part (even if he is a bit shorter in stature than his “older” self) and definitely brings the crowd to his side with his beautiful bass-baritone. He runs the gamut of emotions in this play and handles it all with grace and style. When he first comes to America from his native St. Thomas, he has plans to make hats, play baseball and become a singer. But when his mother introduces him to Howie Albert, who owns a hat factory, Howie recognizes the potential in his frame and upper body strength (from holding cement blocks over his head as a child as punishment) to become a welterweight boxer. Robert Orth gives a powerful performance as Howie- who becomes his manger and mentor on his road to fame and fortune. All the while, his mother- who doesn’t recognize which one of her children he is when he arrives at her doorstep- tries to make his life an easy one in the states. 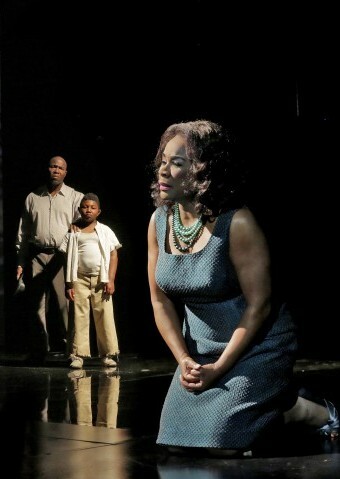 Denyce Graves is outstanding as his mother, Emelda. Her second act aria, accompanied only by a bass, is one of the most stunning pieces of theatre I’ve ever seen. The bass player, Robert Hurst III, is part of the in-pit jazz rhythm trio that accompanies and often takes the lead with the St. Louis Symphony orchestra members. Combined with Fabian Almazan on piano and the amazing Jeff “Tain” Watts on drums, this is just one of many reasons that “Champion” sets itself apart from most conventional operas. In 1962, Emile’s life is changed forever when he meets Benny “The Kid” Paret and, when taunted by Paret before and during the match about his gay life-style, he plants 17 hard blows on Paret in a matter of seven seconds and knocks him out. As a result of his injuries, Paret dies and then begins “haunting” Emile the rest of his life. As Paret (and later his son) Victor Ryan Robertson adds another great voice and acting talent to this overwhelming cast. His final scene with the older Emile is touching and brings a tear to most everyone’s eye. Despite his setback, Emile goes on to win the title and hold it for many years until his deteriorating mental state combined with guilt, drive him into a nosedive where he loses the title, his money and his prestige. A very clever part of the script by Mr. Crisofer divides the proceedings into “rounds” with a ring announcer calling each chapter in Emile’s life. Christopher Hutchinson is brilliant as the announcer, even adding a confusing tone of voice when he announces parts of Emile’s life that have nothing to do with boxing. Rounding out the major cast is Meredith Arwady as the bar owner where Emile first “comes out” and realizes his sexual preference. She belts out her numbers akin to the great musical comedy star from across the pond, Tessie O’Shea. What a delightful character she brings to the proceedings. The efficient set design of Allen Meyer and the astounding lights of Christopher Akerlind combine to make the play even more remarkable. Rusty Wandall’s sound design also shines as does the choreography of Sean Curran- particularly during the colorful festival sequence as Emile prepares to leave St. Thomas for the U.S. This is simply an incredible piece of theatre that is destined to become a showcase in many an operatic season around the globe. Kudos to all involved but especially to this superb cast and the talents of Michael Cristofer and Terrence Blanchard. It’s a moment in the theatre that you’re not likely to forget. Contact Opera Theatre of St. Louis at 413-961-0644 for tickets or more information on this World Premiere. It runs in repertory with three other operas through June 30th. This entry was posted on June 17, 2013 at 9:43 pm06 and is filed under Uncategorized. You can follow any responses to this entry through the RSS 2.0 feed. You can leave a response, or trackback from your own site.